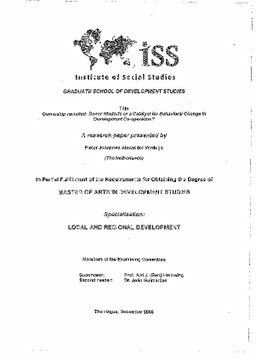 Erasmus University Thesis Repository: Ownership revisited: Donor Rhetoric or a Catalyst for Behavioral Change in Development Co-operation? Ownership revisited: Donor Rhetoric or a Catalyst for Behavioral Change in Development Co-operation? Every person at some point of their life t owns' something. Possibly it was paid for. or it was given to them; a gift. In either case common understanding is that this person now owns it, or differently said, has ownership. This seemingly every-day practice proves to be more complicated in development co-operation, in bilateral aid relations. The ' gift of aid' in bilateral relations is wrapped in a context of intentions, history, economics, politics and strategic deliberations, creating a division between North and South, a dependency and not a mutual well-being. The 'gift' over the years has increasingly come with numerous conditionalities and beliefs of the North and has beenled away from the centrality of people to a focus on effectiveness. Donors in the North want to see the results of their' gift'. The results-focus of donors has led to increased debate on how to make their aid more effective. Over the years aid had become less and less effective. In an attempt to deal with the complexity of the situation donors proposed to move from the imposing of conditions and decisions, to a situation where the, recipients of aid where in charge themselves, they would have'ownership'. Without much understanding of ownership and its manifestation in bilateral aid relations, donors enthusiastically took on this approach to deliver aid more effectively. Donors in recent years have been more and more engaged with ownership in bilateral relations, yet evaluations are showing that the practice is far from being perfect; far from allowing ownership its existence. This research takes a dive into the world of bilateral aid relations and examines ownership as a concept, understanding its complexity and analyzes the reality of its existence within these bilateral relations. It reveals the intentions of donors and scrutinizes whether ownership is plain rhetoric or whether the concept can change the behavior of donors.